Equipment: Dumbbells of the correct weight for your level of strength. Correct Form: Do not swing the dumbbells, arch your back, or tilt your head forward, sideways, or back. Breath throughout the movement. Do not hold your breath. Move the dumbbells slowly and methodically. 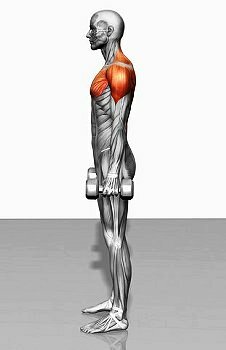 Cautions: To prevent injury do not use dumbbells that are beyond your level of strength. Do not perform this exercise if you experience discomfort, pain, or for medical reasons. Begin at the Start Position. Feet about hip width apart. 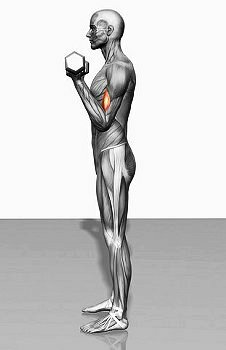 Slowly bring dumbbell toward you as shown in the Finish Position. Repeat 10-12 reps on each side for two sets. Posted on September 1, 2012, in Exercise and tagged bicep exercise, dumbbell curl, home exercise, Strength training, weight traiing. Bookmark the permalink. Leave a comment.